Half timbered houses, cultural attractions, cobblestone streets, scenic beauty and historic sites – the city of Strasbourg in France is indeed fascinating and gorgeous. Strasbourg is located on the France-Germany border in the historic region of Alsace and there are several exciting things to do in Strasbourg. So, book your France Visa Appointment upon the payment of France Visa Fees and visit this beautiful city of France to explore its fascinating culture. There are several popular tourist attractions in Strasbourg and should part of your travel itinerary. The most popular monument of the city of Strasbourg is the Strasbourg Cathedral and you will be mesmerized by its awe-inspiring architecture. The red Vosges sandstone with which the cathedral is built and the massive tower make it even more charming. You can even ascend the tower to reach the roof via spiral staircase (almost 332 steps) for some scenic views of the beautiful city. The historical quarter of the city i.e. La Petite France is one of the most special and iconic attractions of Strasbourg. You will get to explore the beautiful architecture and medieval buildings along with the beautiful waterways where you can stroll. You can even take a canal boat tour to explore the area and scenic vista around in this UNESCO World Heritage site. Yet another landmark of the city is Palais de Rohan, which was earlier occupied by prince-bishops, and now this palace houses three famous museums- Museum of Fine Arts, Museum of Decorative Arts and the Archeological Museum. 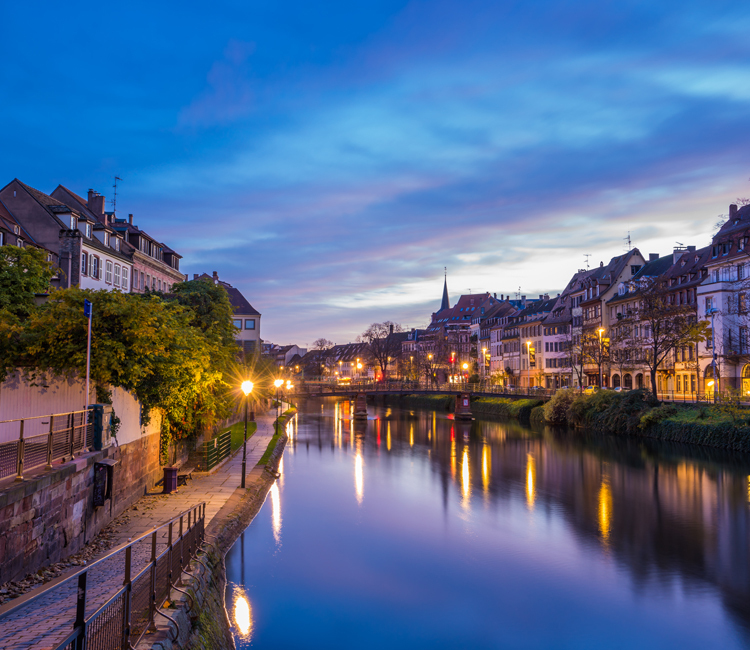 To enjoy the panoramic view of city’s canals, covered bridges and Cathedral, you should include Barrage Vauban or Vauban Dam in your itinerary to Strasbourg. Climb up the Barrage Vauban and you will have an amazing time at the top with the most splendid views. Apart from these, there are several other notable museums and beautiful cathedrals in the city of Strasbourg to explore if you are here for long. The city is indeed beautiful with natural surroundings making it perfect for a bike tour. Hire a bicycle from any of the shops located across the city and cycle around to explore this place in much more fun and tranquil way. You can see the European Parliament located in Strasbourg and Orangerie Park (the oldest and largest park of Strasbourg which is very popular for its beautiful, lush green surroundings) as well while you visit this city. Don’t miss some of the most famous squares of the city like Place Gutenberg which is lined with cafes and restaurants and quite popular among tourists, Rue des Grandes Arcades and many more. Last but not the least, try some popular dishes of Strasbourg like choucroute that is the local variety of German sauerkraut consisting of fermented cabbage and popularly served with sausages, potatoes and other salted meats like pork, chicken etc. Try the Foie Gras of Alsace and don’t miss the popular Alsace wines in Strasbourg. So, quickly plan your visit to Strasbourg, France for an amazing holiday and the most beautiful times.